#177 . . . . . . 1066km in 9 days. How I rode from Lisbon to Denia. 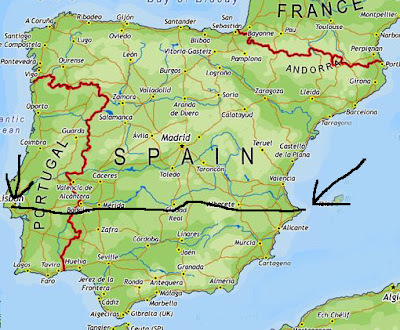 I went through parts of Spain untouched by tourists (and not many Spaniards, either) I went through Portugal's Alentejo to Spain's Extremdura, Castilla La Mancha, a bit of Murcia and finally Alicante. An interesting ride, sometimes exciting and sometimes a bit boring (but in a nice way). avoid the Lisbon city centre traffic). From there biked to Porto Novo and stayed in the Albergaria S Lourenço. Small mis-translation from my Spanish to their Portuguese, I didn't get the ribs for dinner, just one big piece of cow on the bone . . . . maybe it was a big rib? Here is a picture of some typical Portuguese road. The rain in Spain stays mainly in Portugal. It rained - drizzled - rained for four of the five hours on the bike. Fortunately have excellent Assos rain jacket so stayed relatively snug. Évora is a UNESCO heritage site so is full of ancient buildings, cobbles and tourists. Ate out, had grilled tuna. Rained all night and all morning so rode half of stage in the wet. Realised that the last time I rode my bike with rain stinging my face must have been . . . years and years ago! However made good time as the winds have been favourable, except when I crossed back into Spain and had a fight for the last 20km, then to very nice hotel, Palacio Arteaga, in Olivenza. Pictured below: the frontier between the land of the people that say vozshh and the land of the people that say ñ. Interior of Palacio Arteaga, Olivenza. Out in the wilds (see pic below). Very little traffic but good roads.Went down one hill and touched 68.8kph (thats quite fast with a big bag jumping around your handlebars). Couldn't find a hotel so stayed in a self catering chalet (only 35€+tax) and cooked a baked potato and tuna for me tea. Long day; counted at least 9,000 sheep, 4 dogs and 2 cars. Got chased briefly by one of the dogs. Went up big hill. Came down other side. Saw a lake. Arrived 7 hours later in Almaden and the nice hotel I had hoped to stay in was completo :-( so went to another joint. Dined on consomé and monkfish. First 50km on tiny rural roads, all uphill (it seemed) and poorly surfaced. At the top passed a load of firemen playing vollyball and waiting to jump into their helicopter and put out a forest fire. Apart from that didn't see any humanity. Stayed in very chichi b&b but had dreadful meal, beans and chicken wings (I think). Almargo is very nice and has a summer arts festival. More flat roads, diverted to look at the Lagunas de Ruidera. Looked then carried on. Met a couple of mountain bikers who were charging around the Ruta Don Quixote. Ended up in the cheapest hostal of the trip. Beer and Doritos on arrival. Evening meal; soup, lamb chops, ice cream, full bottle of wine. Room (with choice of 3 beds!) and breakfast = 38€. Not bad, eh? Big roads and no traffic. In the Hotel Reina Victoria in Hellin, had a beer and some tapas including some torrednos which turned out to be deep fried pork belly fat - excellent! I think I've discovered the new Power Bar, just need some fancy packaging . . . . . .
After 7 days of good condition, I'm absolutely shattered. Its all uphill, into a stinking headwind and the road surface has been made from bits of left over ashphalt thrown at random to give an unpleasant cobbled effect. If this had been the first day, I would have thrown my bike in the ditch, hailed the first taxi and ordered it to "Take me to Denia - Immediately!" Horrible riding! The only nice bit was the last 10k when I got on a Via Verde, one of Spain's old railway lines that has been converted for the pleasure of bikers and walkers. Breakfast 1. 8:00 Mango, Banana, Black Coffee. Ride 21k to Pego, swim 2k. Meet up with Sally and some of our English friends, Christine & John. Breakfast 3. 14:00 Coffee, toast and marmalade and read the Sunday papers. (Last night we went and watched open air Jazz just near our house). 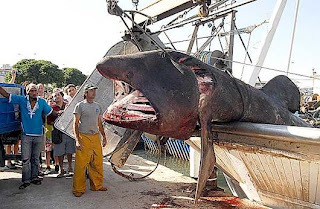 Somewhere very close to where we swim, a shark was hauled in by local fishermen. This shark was BIG, 8 metres long and weighing 4 tonnes.